I hope it is not presumptuous of me to place into the record of this conference, and therefore into the history of the Church, a note to complete the record of the last one. “I should perhaps be guilty of an indiscretion, but I think I will risk it and say that Brother Tuttle has been seriously ill and he needs our faith, the faith of which he has spoken. It will be appreciated if those who have listened to him across the Church would plead with our Father in Heaven, in the kind of faith which he has described, in his behalf” (in Conference Report, Oct. 1986, p. 93). President Ezra Taft Benson, who was the concluding speaker, endorsed what President Hinckley had said and appealed himself for fasting and prayers of faith for the recovery of Brother Tuttle. But Brother Tuttle did not recover. He died seven weeks later. Now, lest there be one whose faith was shaken, believing prayers were not answered, or lest there be one who is puzzled that the prophet himself could plead for the entire Church to fast and pray for Brother Tuttle to live and yet he died, I will tell you of an experience. I had intended to tell this at his funeral, but my feelings were too tender that day to speak of it. One Sunday when Brother Tuttle was at home, confined mostly to his bed, I spent a few hours with him while Marné and the family went to church. He was deeply moved by the outpouring of love from across the world. Each letter extended prayers of faith for his recovery. Many of the messages came from South America, where the Tuttle family had labored for so many years. That day we reviewed his life, beginning with his birth in Manti, Utah, to an ordinary Latter-day Saint couple. We talked of his father, whom I knew, and of his mother, a faithful temple worker. He talked of his mission, his college days, his marriage to Marné Whitaker, and his heroic service in the Marines. Then we relived our days teaching seminary in Brigham City and supervising the seminaries and institutes of religion. He spoke of his call to the First Quorum of the Seventy and the assignments that followed. Soon the Tuttle family was called to South America. They were hardly settled back home when the Brethren interviewed him about returning. Others could say, “Of course, if you should call us, we would go.” But not him, nor Marné, for they had made covenants. Without complaint, his wife and family followed him back time after time for a total of seven years. No matter that he had never recovered from serious physical troubles which began on his first assignment there. That day Brother Tuttle spoke tenderly of the humble people of Latin America. They who have so little had greatly blessed his life. Brother Tuttle wanted those blessings from our prayers for those struggling souls whom most of us hardly remember, but whom he could not forget. The scriptures teach that “the effectual fervent prayer of a righteous man availeth much” (James 5:16). We do not know all things, but is it wrong to suppose that our prayers were not in vain at all? Who among us would dare to say that humble folk here and there across the continent of South America will not receive unexpected blessings passed on to them from this man who was without guile? May not lofty purposes such as this be worked out in our lives if we are submissive? Now, I know that skeptics may ridicule such things. But I, for one, am content to believe that our prayers were accepted and recorded and redirected to those whose hands hang down in despair, just as Brother Tuttle had requested. In any case, ought we not to conclude all our prayers with “Let thy will, O Lord, be done”? During his last weeks he was always pleasant, invariably comforting those who came to comfort him. I was present when he called his doctors to his bedside and thanked each one for the care he had received. He was determined to live through Thanksgiving Day lest his passing cast a shadow of sorrow upon his family on that holiday in future years. That evening he saw each of his children, called those who were away, expressed his love and blessings, and bade them farewell. It was very late when they reached Clarie, who lives in Alaska, but his parting must be delayed until that was done. Early the next morning, without resistance, with a spirit of quiet anticipation, he slipped away. At that moment, there came into that room a spirit of peace which surpasseth understanding. Marné had been before, was then, and has been since, a perfect example of serenity and acceptance. Now, to draw a lesson from this experience. 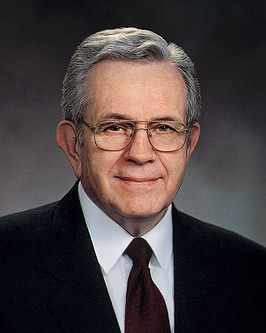 Brother Tuttle served twenty-eight years as a General Authority. He traveled the world. He supervised the work in Europe for a time. But with all the places he would go and all of the things he was to do, he repeatedly said that the crowning experience of his ministry was his service as president of the Provo Temple with his beloved Marné at his side. Few know the demanding schedule of a temple president. The day may begin at three in the morning and end only too close to that same hour. It was not that he was presiding over the temple but that the calling allowed him to be in the temple. He would have been quite content to serve under another. His feelings about that assignment were not due so much to his understanding of what a call is, as it was his understanding of what a covenant is. A covenant is a sacred promise, as used in the scriptures, a solemn, enduring promise between God and man. The fulness of the gospel itself is defined as the new and everlasting covenant (see D&C 22:1; D&C 66:2). Several years ago I installed a stake president in England. In another calling, he is here in the audience today. He had an unusual sense of direction. He was like a mariner with a sextant who took his bearings from the stars. I met with him each time he came to conference and was impressed that he kept himself and his stake on course. Fortunately for me, when it was time for his release, I was assigned to reorganize the stake. It was then that I discovered what that sextant was and how he adjusted it to check his position and get a bearing for himself and for his members. This president understood the word covenant. While he was neither a scriptorian nor a gospel scholar, he somehow had learned that exaltation is achieved by keeping covenants, not by holding high position. The mariner gets his bearing from light coming from celestial bodies—the sun by day, the stars by night. That stake president did not need a mariner’s sextant to set his course. In his mind there was a sextant infinitely more refined and precise than any mariner’s instrument. No matter what citizenship or race, whether male or female, no matter what occupation, no matter your education, regardless of the generation in which one lives, life is a homeward journey for all of us, back to the presence of God in his celestial kingdom. Once we have received them for ourselves and for our families, we are obligated to provide these ordinances vicariously for our kindred dead, indeed for the whole human family. Now, there are those who scoff at the idea of vicarious ordinances performed for the salvation of souls. They think it all to be very strange. No thinking Christian should be surprised at such a doctrine. Was not the sacrifice of Christ a vicarious offering for and in behalf of all mankind? The very Atonement was wrought vicariously. The Lord did for us what we could not do for ourselves. Is it not Christlike for us to perform in the temples ordinances for and in behalf of those who cannot do them for themselves? Genealogies, or family histories, as I prefer to call them, are an indispensable part of temple work. Temples are nourished with names. Without genealogies, ordinances could be performed only for the living. Searching out the names of our kindred dead is a duty of consummate importance. There is a spirit which accompanies this work very similar to that which attends us in the temple itself. Missionaries and those with small children may not be able to devote much time to this work at present, but you can keep the spirit of it. You can talk to the old folks and record what they say, keep family records, attend the temple. Be careful! It may well be that those who have that interest in such things have chosen the better part. And I would say to you, if you are called to other service, or do not have an interest in genealogy, do not belittle or stand in the way of those who do. Give them every encouragement; contribute what you can. The Prophet Joseph Smith said: “The doctrine or sealing power of Elijah is as follows:—If you have power to seal on earth and in heaven, then we should be wise. The first thing you do, go and seal on earth your sons and daughters unto yourself, and yourself unto your fathers in eternal glory” (Teachings of the Prophet Joseph Smith, sel. Joseph Fielding Smith, Salt Lake City: Deseret Book Co., 1938, p. 340). The Spirit of Elijah of which the prophets have spoken is very real and accompanies those who seek for the records of their kindred dead. The more I have to do with genealogical work, the more difficulty I have with that word dead. I know of no adequate substitute. I suppose departed would suit me as well as any. I have had too many sacred experiences, of the kind of which we never speak lightly, to feel that the word dead describes those who have gone beyond the veil. Temple and genealogy work are visible testimonies of our belief in the resurrection and atonement of the Lord Jesus Christ. Should we doubt that we live again beyond the veil, what reason would we have to do the things we are doing? This work is our witness of the redemptive power of the sacrifice of the Lord Jesus Christ. Now what of Brother Tuttle or of his family? I remind you that it is a veil, not a wall, that separates us from the spirit world. He kept his covenants. Veils can become thin, even parted. We are not left to do this work alone. They who have preceded us in this work and our forebears there, on occasion, are very close to us. I have a testimony of this work; it is a supernal work in the Church. I am a witness that those who go beyond the veil yet live and minister here, to the end that this work might be completed. God grant that we who have an opportunity to have part in it might seek that opportunity and labor with all our might, in the name of Jesus Christ, amen.